I was going to say "shithole". 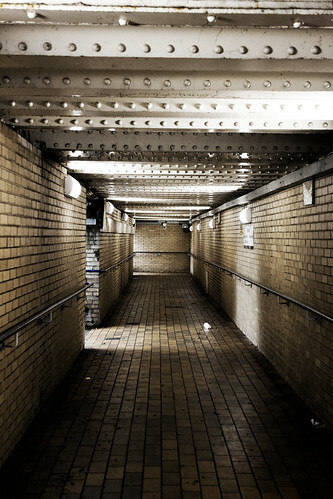 Yes, I can understand if this is your first visit and this ominous underpass is your first experience of town you may feel your bottom tightening as you have flashes of a number of horror films popping into your brain. This could be the spot where someone deranged or unhinged comes at you wanting to make all your innards become outards. But nay. Should I ever get round to writing the travel guide for Dunfermline that has been procrastinating in my brain the title will truly be "Dunfermline: Honest it's not a Shithole". It's got pretty trees and buildings and history and Peacocks. Yes, there be Peacocks. You can't look down your nose at a place that has Peacocks. For they are pretty birds with big colourful bottom feathers. Like a thousand eyes staring at you. There you go, trees and birds. And old buildings with Robert the Bruce's body. It's buried in one of them. We don't just keep it laying about gathering dust and getting in people's way when they're trying to get to their seat. Because that would be rude.